QAnonTalk.com: Q-Anon Tweets by @ZumaDogg for 03.01.18 -- DECODES & ANALYSIS (FYI: Cruz didn't fire a shot -- Sheriffs Did It -- So STOP Debating Gun Control/Law Changes: Won't work if Broward County Officials DID IT! Q-Anon Tweets by @ZumaDogg for 03.01.18 -- DECODES & ANALYSIS (FYI: Cruz didn't fire a shot -- Sheriffs Did It -- So STOP Debating Gun Control/Law Changes: Won't work if Broward County Officials DID IT! STOP saying=ALL signs were there w/#Cruz; FBI did nothing; need more gun control, when the WHOLE THING was STAGED/EXECUTED by #BrowardCounty #DeepState DEMS=Sheriffs SECURED scene for REAL shooter, "Cobra" Staubs. NEW LAWS/etc DON'T matter if THE SHERIFFS DID IT=Cruz did NOTHING! When #PedoGate CEO #JohnPodesta issues a veiled threat to@POTUS son in law and advisor=podesta must know/believe he's close to being arrested=nothing to lose -- and could be interpreted as a tweeted trigger for a hit on JK. #QAnon watchers: if there is something you want to know about anything #Q related=tweet me your question. I see/hear a lot of wondering and speculation to known stuff, already. Donation(s), needed, please. PayPal.me/ZumaDogg. 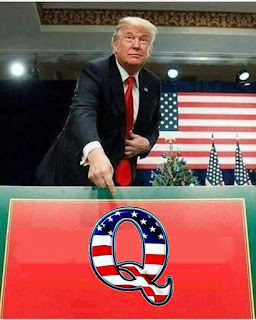 And see my new blog, QAnonTalk.com. (After 11 yrs on YouTube/Twitter, both censored me today!) Donate if u can afford anything. WHY isn't @POTUS @realDonaldTrump having REAL/ONLY #FLschool shooter arrested. If I know it was #DeepState black ops legend William 'Cobra' Staubbs, so does @WhiteHouse & @NSAgov. America in panic for wrong reason. COBRA works for #BrowardSheriff. #Oprah is vomitous: Says, "If God says to run, I'll run!" She's modern day Jesus; hand-picked, not only by #DeepState, but by GOD, his/her self! Of COURSE a compassionate God WILL say run=to save humanity from @realDonaldTrump. Aka: If my friends assassinate@POTUS, I can run. I'm an #INFJ prophet. (Instinctive/sixth sense). I sit here, round clock and decode #Q/#Anon chat. Good news=ALL the indictments and#GitMo tribunals are coming. BAD NEWS=not until November. Been 100 years of #DeepState embedding. Nov=in 8 seconds, relatively speaking.